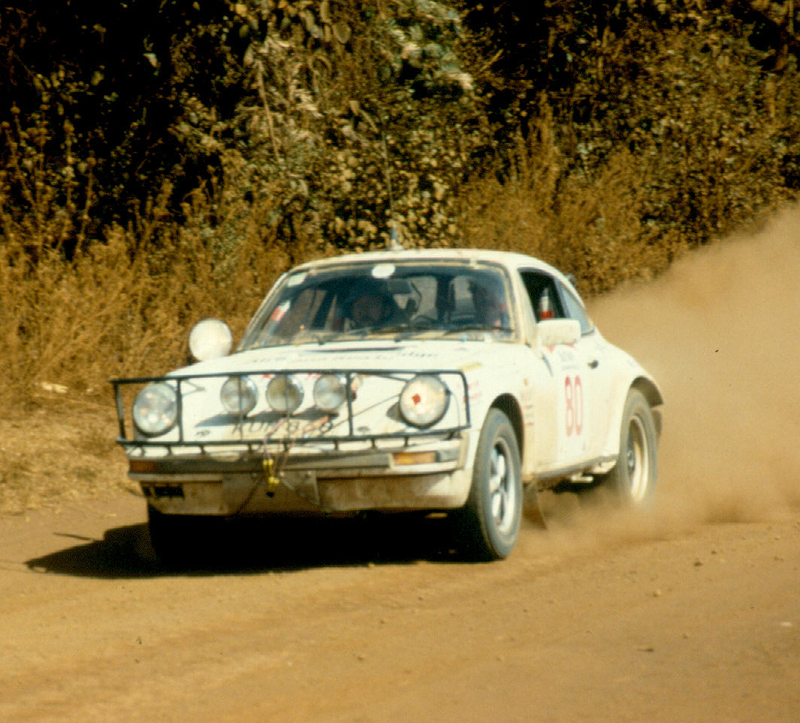 Swiss-Uruguayan Easter Safari Rally – Kenya, 16th to 20th April 1987. 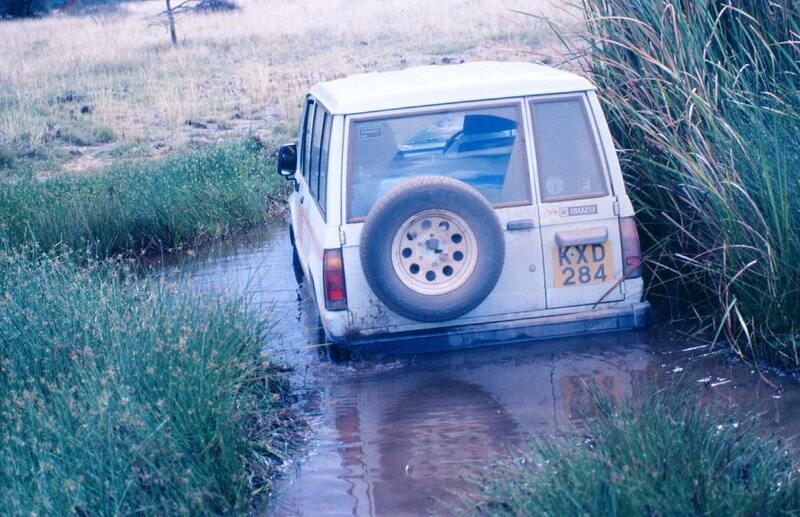 Coming out of a riverbed: Have you put the four-wheel drive on? Both teams excellent, both “ex-aequo” at every leg, despite major technical and mechanical problems. Cars and skills were tested through all types of weather, on all kinds of tracks, marshy or dry. Thursday, 16th of April – Getting in the mood! Our departure took place in Nairobi at 2.00 PM roughly. Unexpectedly, everybody from the town was along our way to greet us and enjoy our way through! Our success was huge and tremendously exciting. At around 3.00 PM we met a few cars driven by “amateurs” coming our way at high speed. All the cars were numbered, full of stickers and very noisy. It was a kind of a funny race, which looked like a pale copy of ours. We gave way very politely, full of respect for the beginnerswe thought that they were showing off a bit too much. Anyway, the atmosphere was light and happy: the weather was perfect, hot and sunny. The roads, either tarmac or dirt, were dry. The coffee bushes were all in blossom, which gave a marvellous scent to the air. No better conditions were expected for a very enthusiastic and fair rally. 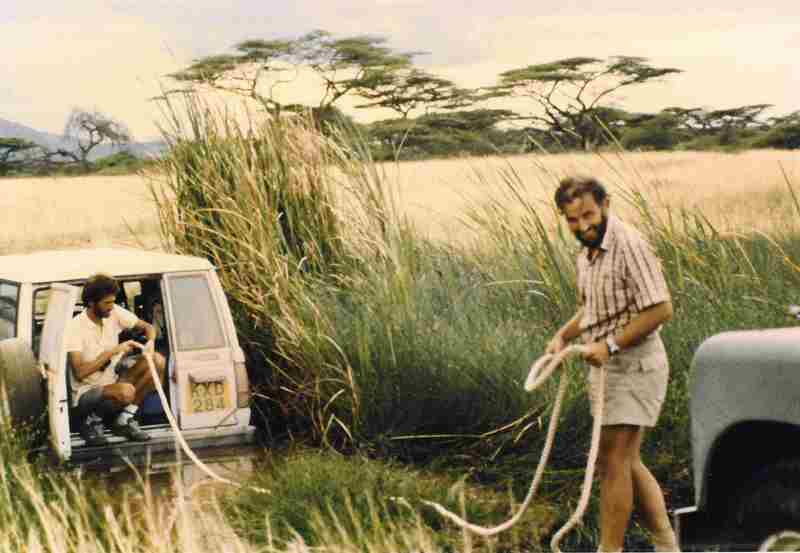 One of the “real” Safari Rally car: It looks more like a rally than like a safari! We reached the town of Meru without any trouble, but well after dusk. Towards the end of the journey the Land Rover got a bit weak and it just managed to climb up to the “Pig and Whistle”, our stopping place for the first night. Once our luggage was in the cottages, we met at the terrace. But the noise of the Safari Rally going through Meru while we were having a lazy late drink (7.30 PM) made us feel tense! And so we slid to the annoying question: Is the Land Rover all right? Will it be ok tomorrow? The usually optimistic 4WD was dubious and the usually pessimistic ScoutSpirit showed -as usual- calm and detachment! Morality: one’s very deep characteristics can change depending on who or what is the subject of the problem! Later, the meal, excellent but overwhelming, helped us to forget about any possible doubts and the best plan was to ensure a good night to everybody! 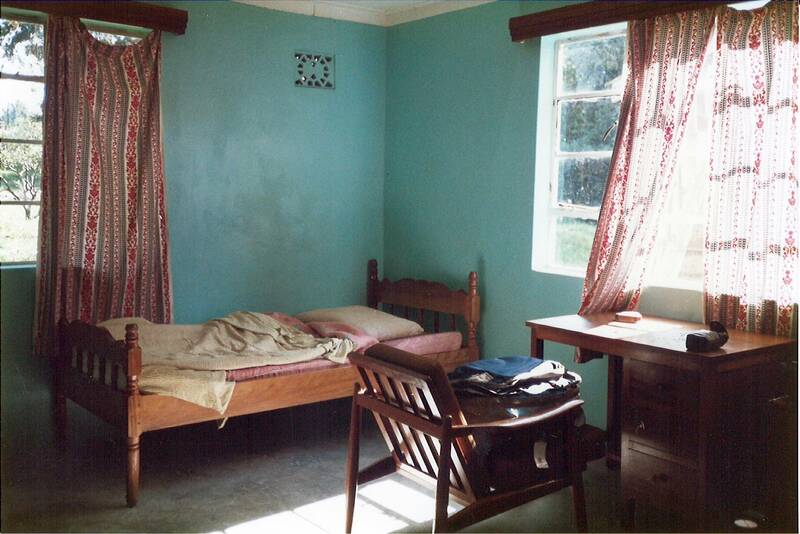 Our quiet room at the Pig & Whistle Hotel in Meru (built around 1930): A good night for a good rally’s leg. 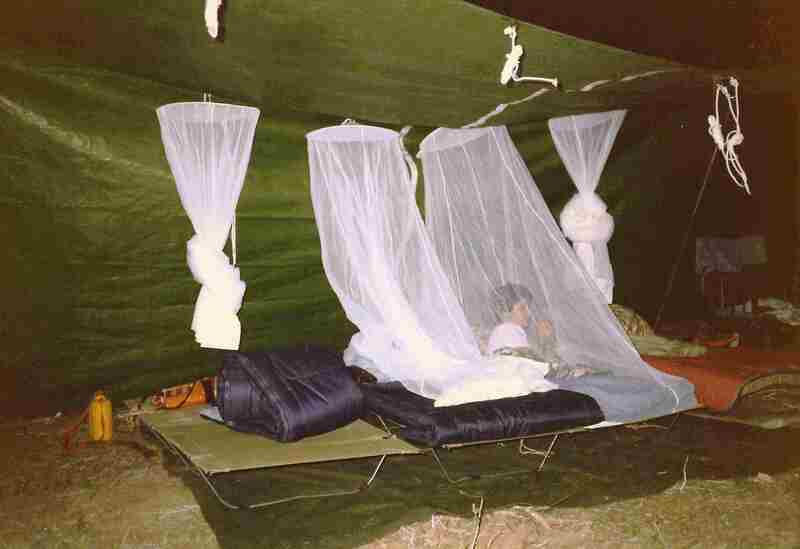 Friday, 17th of April – Bivouacking in the bush! We got up at 8.00 AM, a GORGEOUS sunshine greeting us at the doorstep. Things stayed all right until the end of breakfast. 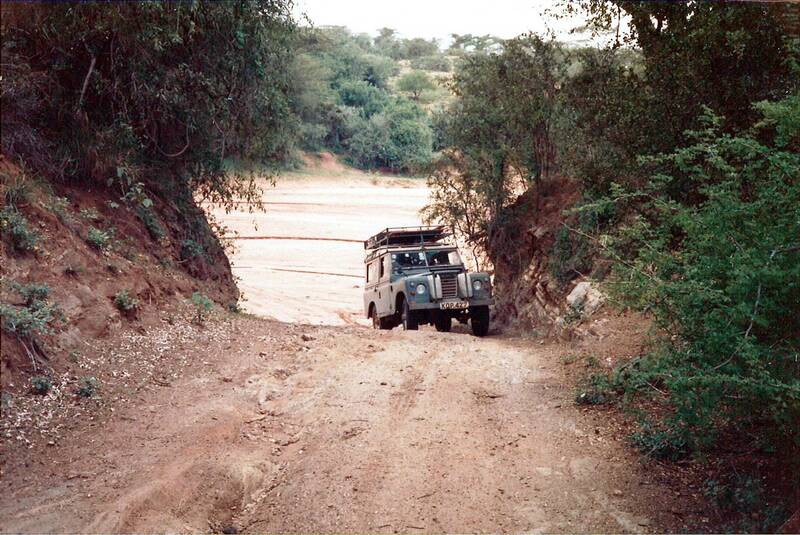 But then, the Land Rover gave us bad news: It was tired, exhausted, no more power and wouldn’t say why. Kindly, the manager of the hotel proposed his mechanic. Good news, the fundi kwa gari (the cars’ specialist = the mechanic!) was trained on Land Rovers. This was our luck in misfortune. The man came and gave his diagnostic: “Burnt cylinder head gasket”, something not nice to hear in that GORGEOUS morning when everything was just starting. It was 10.00 AM and he said that he could repair it for 1.00 PM. Doubtful but hopeful, 4WD and ScoutSpirit went with him and both cars to his garage. Meanwhile, X-ray and I had a good “seed-collecting-time” while inspecting trees and various plants in the garden: Custard-apple trees, fig-trees, coral-trees, African tulip-trees, a sort of climbing cucumber, frangipani, etc. At 1.30 PM or so, men and cars came back, ready for another brilliant -if somehow delayed- start! We thanked the manager heartily, filled the tanks up and bought the newspapers. We left Meru after a light picnic. 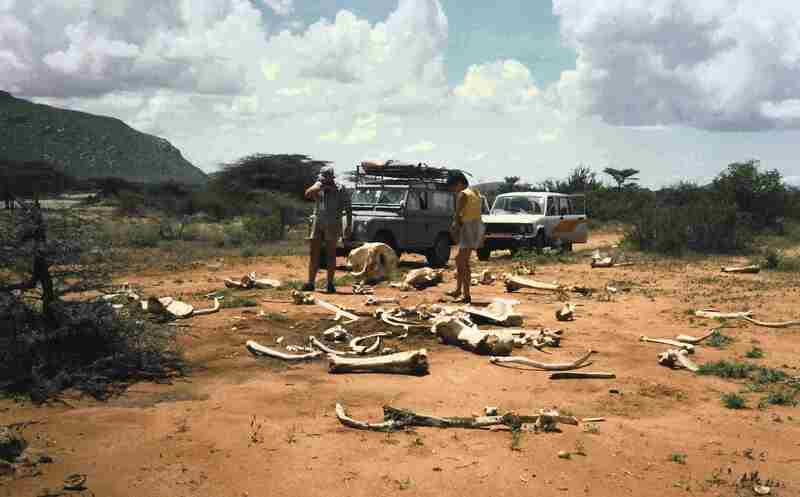 It would have been nice to have driven eastwards to Meru National Park, the only place in Kenya at that time which hosted white rhinos (introduced). This is also where Elsa, the very famous lioness raised by Joy Adamson, was buried. But, in view of the mechanical delay, we kept that itinerary for another possible safari and headed to the north, to Shaba National Reserve. By that time, I discovered that we were going to a place we had no map of! The Swiss part of me thought “well, we are really looking for adventure”. I understood later why it was not that adventurous: Shaba is a very small national reserve and there is only one main track through it! I was then ready to follow happily, not that I really had the choice but that I was much relieved not to go to the “outback” without enough training. 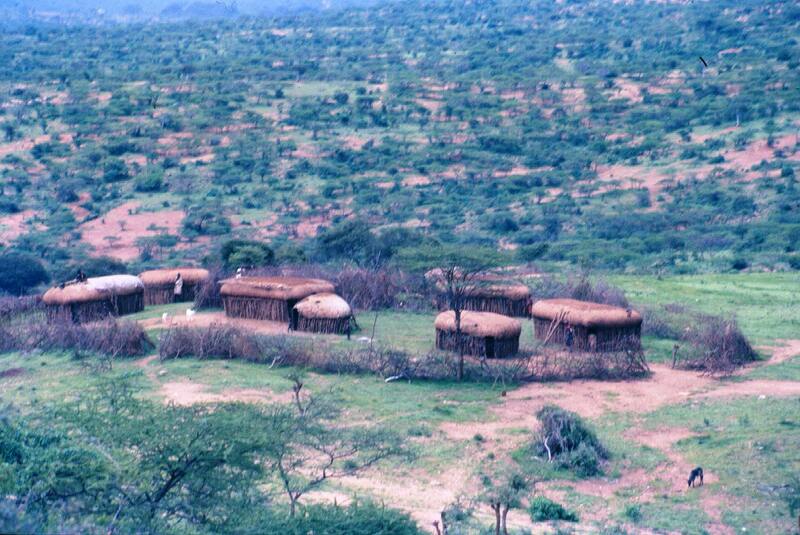 Samburu’s manayatta (family settlement with huts and traditional spiny fence): Somewhere on the way to Isiolo. After Isiolo, we passed Samburu National Reserve and Buffalo Springs National Reserve on the left hand-side and turned to the right near a military camp. With Shaba National Reserve, these three national reserves make a well protected area, famous for its “northern dry-country” game, such as reticulated giraffes, Somali ostriches, Grevy zebras, gerenuks, oryx, kudus (both greater and lesser) and so on. From that point on, the semi-desertic landscape appeared and it was truly marvellous, well I would say GORGEOUS! 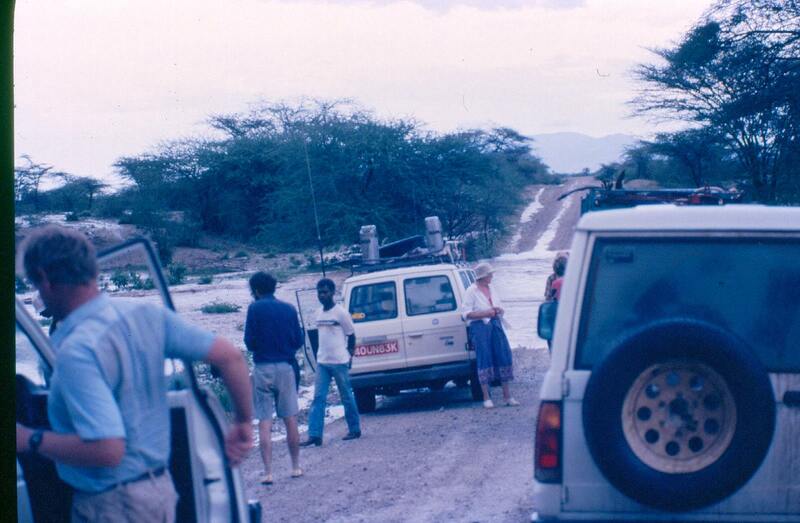 We were -however- driving into temporary rivers because it had just been raining heavily (April is the start of the rainy season in Kenya but heavy rain is not expected in the northern part!). With rays of sunshine on the spurting water, the scenery was “not bad” at all. I had great fun trying to get a picture of the Land Rover surrounded by water, the sun shining through. As it was following ours, I was twisting myself out of the window, trying to stay inside despite the many bumps. Sparkling water under sunshine: well-tried but the picture doesn’t really render the full atmosphere. We eventually arrived at the gate of Shaba National Reserve. Built in the middle of that totally wild land, at the edge of that national reserve, the office was yellow, I mean completely yellow. Not even a frame or a nail was of another colour! When we got in, we saw that inside, it was yellow too, of course! We found a man waiting as If he was just expecting us to come at that time precisely! Nevertheless, I wonder how many persons he may see in a week, except for his few companions? We first went to visit the “ghost” tented-camp. It was a pathetic sight: Not GORGEOUS! The last drops of rain were dripping from the broken roof into our necks and the bright white toilet was shining in the deep green grass near a tree. But the camp may have been pleasant because it is right above the Ewaso Nyiro river and has got springs and the shelter of big trees. We decided then to go further and to find the other campsite. It was about 6.00 PM, we still had time, but not too much. As nothing like a signboard appeared (If you read the ninth footnote, you already know that without a signboard, there is no way to make sure that you have reached the campsite! ), we thought that we had missed it. So we chose our own one in the middle of the bush: just the perfect place, away from animals’ tracks (we were mainly beware of hippos there), flat surface, two big trees, nice stones to hold the grid above the fireplace and water not far away. At the beginning, we didn’t notice the impressive quantity of very aggressive acacia thorns, so we thought that it was like paradise! Yes, if you forgot about the many punctures in your soles, it really was ideal. The so-called “sleeping-room” was composed of a big tarpaulin and sheltered by a double flysheet, building one wall and the roof. It could sound strange but a car was part of it as we had only three poles to hold the stuff and the Land Rover was the fourth one… an interesting pole I must say. Other advantages of this architectural puzzle were that it supplied light and water and provided some handy space to prepare the meals and store. A few stones, a few logs and we got a big fire going. A few armchairs, a table and drinks and we were well settled. “Shouldn’t we stay two nights in this place? It is so GORGEOUS!” said 4WD and we were already agreeing “Yes, after all this work, it is not worth removing everything and starting again tomorrow… and would we find another spot like this?” First step towards settlement not to say laziness! We voluntarily postponed the decision to the following morning: “Let’s think about it tomorrow. Anyway, we will do as we will wish”. We looked at the bedroom, so attractive with our four camp-beds, mattresses, pillows, sleeping-bags and mosquito-nets! We looked at the fire, its smoke chased by the wind towards the darkness. Happy us! The dinner, one of X-ray’s fantastic stews was bubbling on the fire and her famous “pineapple-pie” was also waiting for us as much as we were waiting for it with the memories of earlier occasions! We were having a good time and we were very much aware of it. A Scops owl called in the distance and we stared at the sky hoping to discover the announced full moon. We argued about the time of the moonrise and it eventually appeared (at 10.00 PM), shortly before we prepared for the night’s sleep. I must add here that the idea of bivouacking was a real excitement to ScoutSpirit and I as we never did it before… Having as unique protection a mosquito-net while you are deep asleep in a game reserve where lions, leopards, cheetahs, elephants, buffalos, hippos and hyenas may be roaring around is quite challenging… it gave a certain chill down our spines! 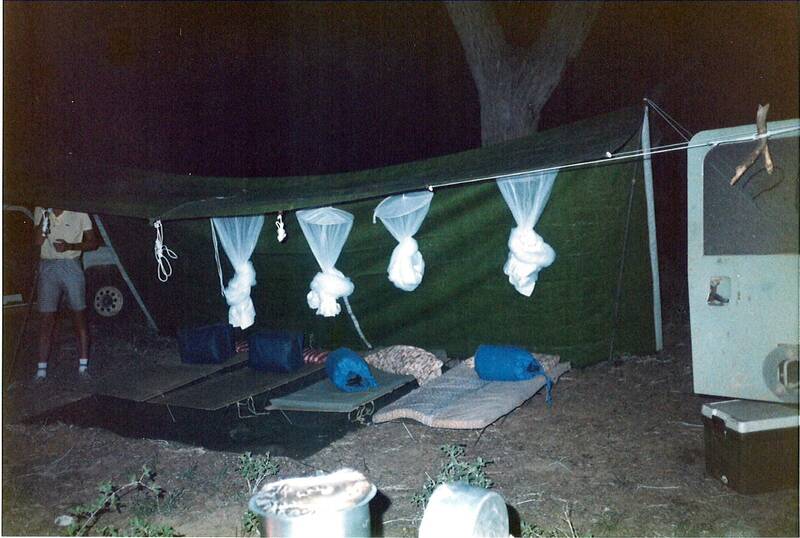 How to sleep in the bush: Bivouacking is nicer but a bit more scary than camping! Saturday, 18th of April – Getting soaked! We woke up at 9.00 AM after a GORGEOUS night shared with nature and lit by a bright moonlight. We soon shared a “solid” breakfast before leaving for a game drive. The ladies were installed on the top of the Land Rover. ScoutSpirit was following just behind us with his car. We drove along the river, aiming for Penny’s falls. It was wild and beautiful. On our way, we passed some campsite (occupied!) and a sort of “kopje”. Was this the campsite we aimed for the night before? ScoutSpirit, with whom we had lost sight of for a while, came back with a huge tortoise-shell which he found on the riverbank for us to see it. Soon before we reached the falls we forded a stream. When we looked back, we could see the Trooper diving into this narrow but quite deep stream that drains the marsh and forms the famous waterfalls further down! Fortunately, the car came out easily and we could reach the falls and leave the two vehicles under a big tree, shade being strongly recommended at this time of the day where the temperature can easily reach 40°C. We had been told that here was where Joy Adamson lived for a period of her life. But there was no more building or sign of any settlement anymore to see around. Not being looked after, it certainly disappeared in the vegetation very quickly. We climbed down a rough and steep slope heading for the Ewaso Nyiro river and discovered the magnificent falls with their dark red but transparent water from the marsh mixing up with the “white coffee” water from the main river: GORGEOUS again! On the sandy shore we had our lunch, roasting ourselves in the sun. After the picnic, 4WD and X-ray went walking a bit further and came on a few crocodiles… we set off for the cars quite rapidly! 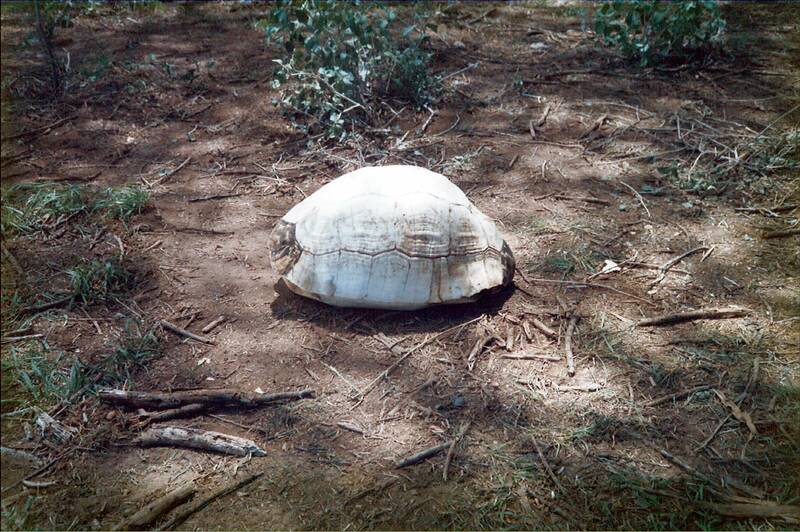 Measuring about 40 cm length: The famous tortoise-shell that “polluted” part of the safari! On the way back, the second crossing of the small river became a problem: The Trooper stopped in the middle of it, just in front of us, and the engine failed kabiza (totally… and total bad news!). Anyhow, after a while, we saw ScoutSpirit crawling inside and appearing finally out of the boot-door! Water was about the same level as the doorstep. Hands under water, he attached the towrope and 4WD’s car pulled the Trooper backwards a little bit but not much as the four wheel-drive was not on. At the second attempt the job was done. But the Trooper still refused to start as the engine was soaked. Soon we realized that the floor was flooded too so we started to pick up some drooling things and put them outside to dry under the sun. Then we had to remove the water from the carpets and absorb it as much as possible. To complete the task, we drove back, doors open and full heat on. The “ex-dry” tortoise shell, still with us, got quite wet again. It was stinking like hell! In the marsh: It is a pleasure to get stuck -and unstuck- with such good adversaries in that rally! 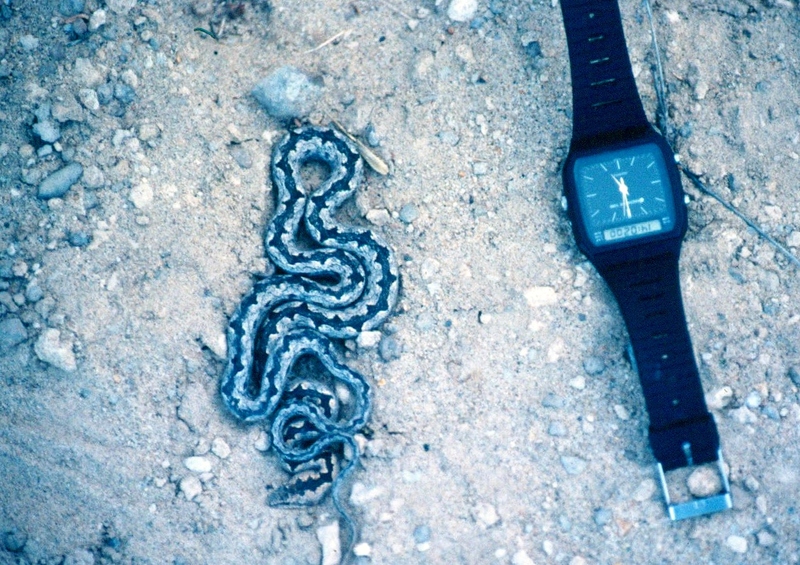 The very nice and small bark snake: At first we didn’t know it was supposedly harmless to man! Then it was “mate time”. Mate is a South American beverage made out of a plant that, once dried and crushed, is mixed with hot water in a calabash (also called mate) and drank through a sieving straw (bombilla). Every time the calabash is emptied by a drinker, it is filled with hot water again and passed to the next person of the group. This is a very social way of drinking that can be compared to our Swiss habit of eating melted cheese in the same pot for the whole table’s company, traditional and collective dish that we call “la fondue”. 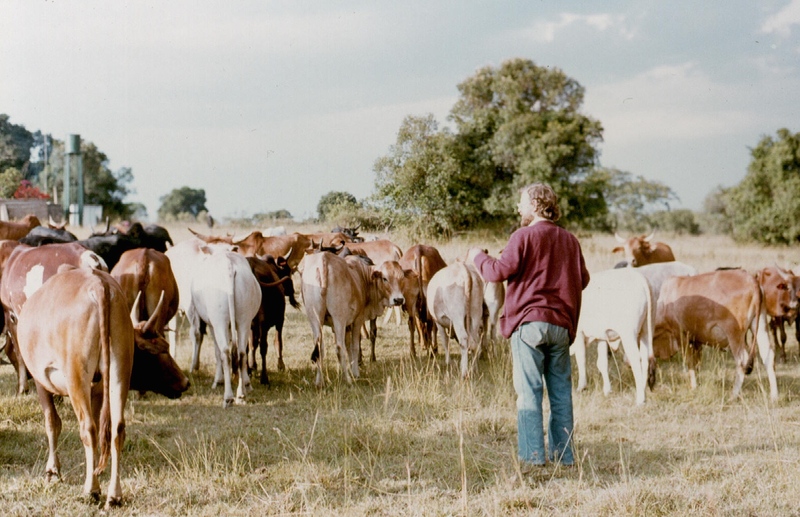 So you see, travelling with our Uruguayan friends, it was impossible to ignore that fantastic tradition, even on safari… as they also had to discover the famous fondue made with “El Molo” cheddar, dry papaya wine and vodka (all produced in Kenya), cooked on the fire in a famous Kisumu earth pot! But that took place in another safari and would be told about another time. As we experienced it with great interest, mate is really good, social and somehow “sacred”! So much that we became very talkative for one hour non-stop! As dusk was coming closer, we hurried towards our “home-sweet-home”, still with doors wide open and full heat on for the Trooper to dry up. But we knew that it would take a few days to dry kabiza. We passed again by the beautiful rocks that we called “kopjes” and saw surprisingly no game at all. We came to the camp in the dark and under the rain which had spoiled our things: wet camp-beds, wet armchairs and worst, wet firewood! In spite of that, X-ray managed to light a pretty nice fire after we gathered some minute more-or-less dry twigs under some partly sheltered areas. Thus we could put our things around the fire in order to dry… It was time consuming. I was busy too with my belongings that had been soaked in the marsh-juice, so I kept waving them near the fire, in front of my dear friends who became sea-sick as a consequence! Sunday, 19th of April – Heading north shortly! Yes, the idea of using the elephant dung was brilliant. The fire was still hot with quite a few embers and started on easily, earlier on that morning, said ScoutSpirit (I can’t tell as I was fast asleep at that time). After breakfast, the decision was taken to try and reach the Matthews range for the night. So straight away, we entered a big spell of activity till 11.00 AM. A few pictures were taken on our departure: The tortoise-shell that was still around and an elephant skeleton that was lying a bit further along the track. 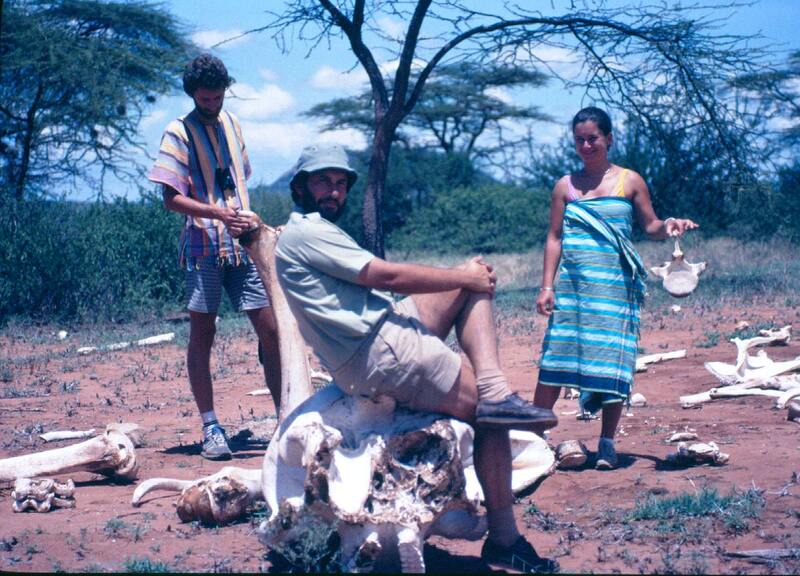 The hide of the latter was still there also, stinking horridly but no need to look for the tusks… poachers’ business! At 12.00 AM, we reached the gate and drove on towards the north. 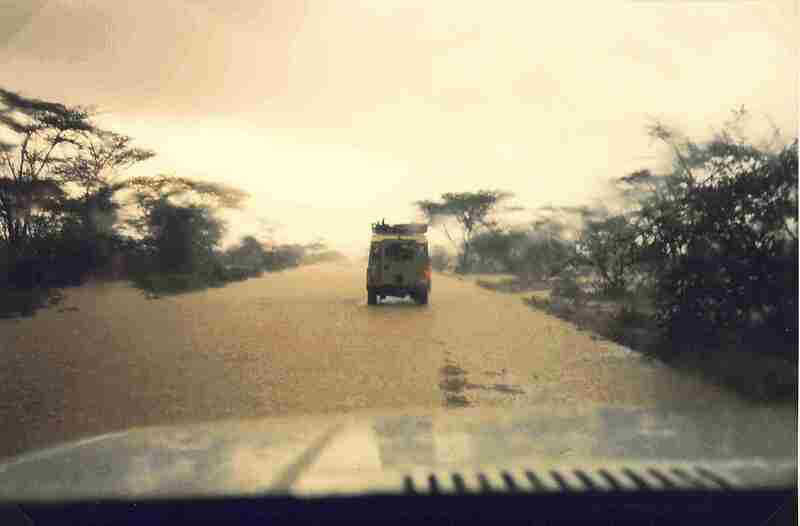 We passed Archers’ Post and, later on, drove straight ahead as we left the road leading to Wamba on the left hand-side. We could admire the very nice alignment of the dirt road towards the big mountains of the Matthews range: a GORGEOUS view although it soon became very clouded! The way began to grow wilder as we had to cross big luggas (dry riverbeds, but don’t ask me where this word comes from) and very rocky and hilly places… but always there was a hut or a shamba (cultivated field or/and dwellings, usually wooden houses) to see nearby. 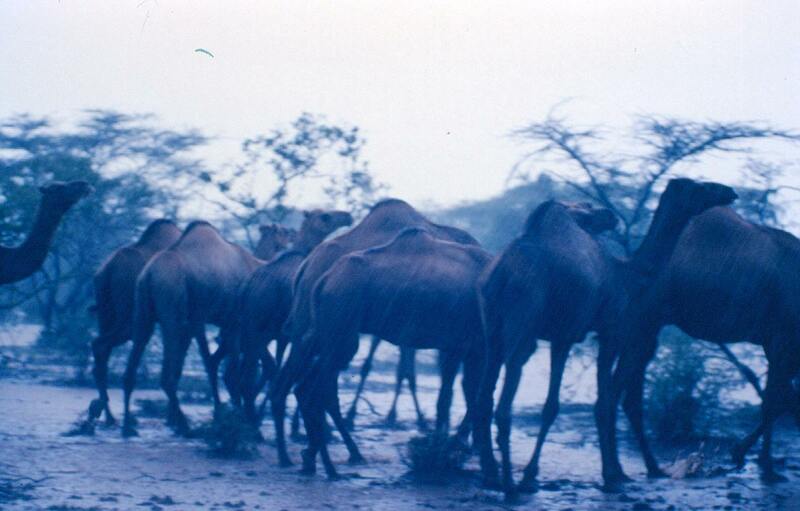 It started to rain cats and dogs thus inflating the rivers very quickly, so we decided to go back south and join Samburu National Reserve by a shortcut rather than to continue for the Matthews. 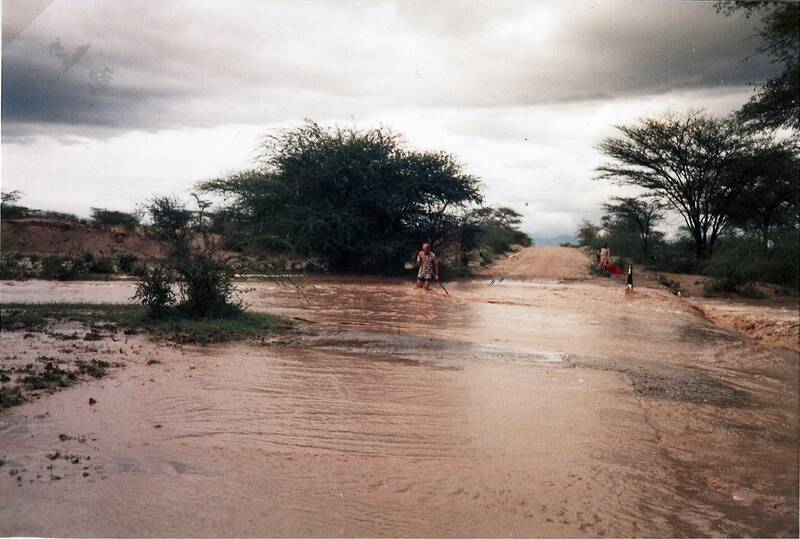 It is well-known that the mountains attract the clouds and means much more rain than on the plains…The roads were too flooded to our taste and mainly too risky for the cars… there was no point to get stuck there for the night! 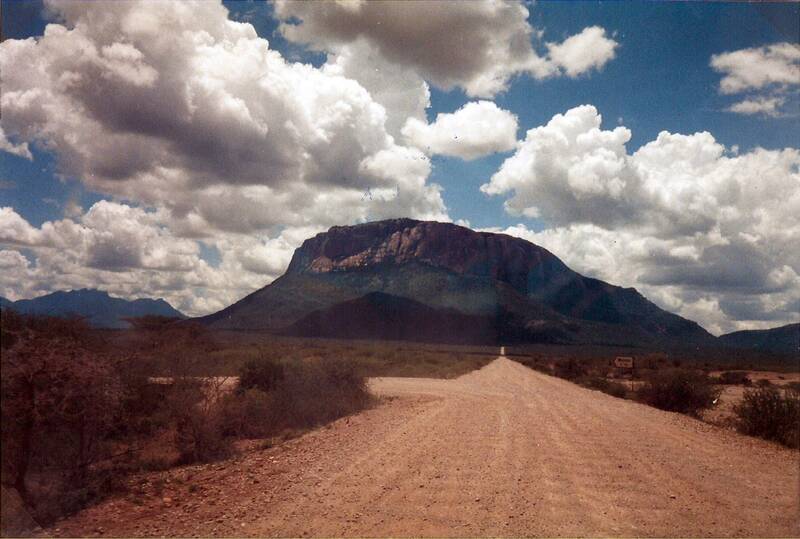 Matthews mountains and corrugated iron dirt-road: Above a certain speed, you “fly” and it stops shaking! Very heavy shower: Everything was under water in no time! Once in Samburu, quite late in the afternoon, we did a quick game-drive and passed near the lodge, but on the opposite bank of the river, where they put some bait on a tree to attract leopards (although we don’t recommend this way of dealing with wild animals!). At the campsite (this time clearly announced by a board but nothing else revealing it! ), everything was wet. But that was better than flooded! It was then time to set up the camp for the last night of that much appreciated Easter long week-end. Thank to the experts, it was done in no time… We were so busy that we forgot easily that the leopard didn’t come to the bait. Our menu, cooked on the fire, included fine spaghettis with a spicy egg and tomato sauce (Mediterranean way), delicious chapatis (Indian flat bread – the dough wouldn’t grow!) with butter, banana cream with plums, biscuits, tea, coffee… not bad as usual. Monday, 20th of April – Winning the rally! 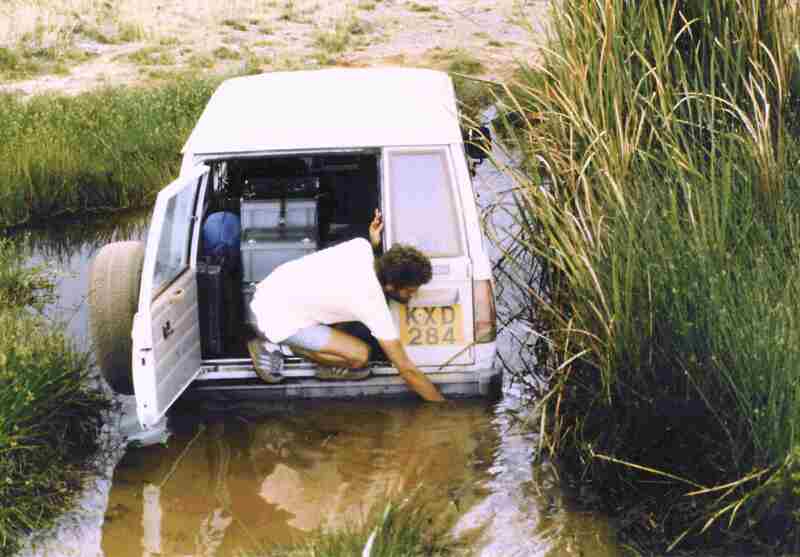 Our Swiss-Uruguayan Easter Safari Rally had to be finished on that very day, in Nairobi. So we woke up at 7.30 AM and went quickly for a game-drive, the four of us in the same car, after a cup of tea and a piece of cake. Again, the ladies went on the Land Rover’s roof rack and, Good Lord, were still there at the end despite thorns and baboons menacing to jump on the roof near us! We haven’t seen much during that game-drive: a bunch of crocs, some hornbills and a few other birds, impalas, reticulated giraffes, oryx and baboons. That’s all! Nothing compared to other times in that area, not to speak about a safari in Ngorongoro’s crater or in Maasai Mara’s plains! But we weren’t there for watching animals, were we? Of course, we were there to win that bleedi rally… (just kidding!). But, not joking anymore, the open view on the wide Ewaso Nyiro river, with its doum palms (Hyphaene thebaica) and acacias (Acacia elatior) was fully GORGEOUS. It looked somehow very exotic, almost like being near the Indian ocean! 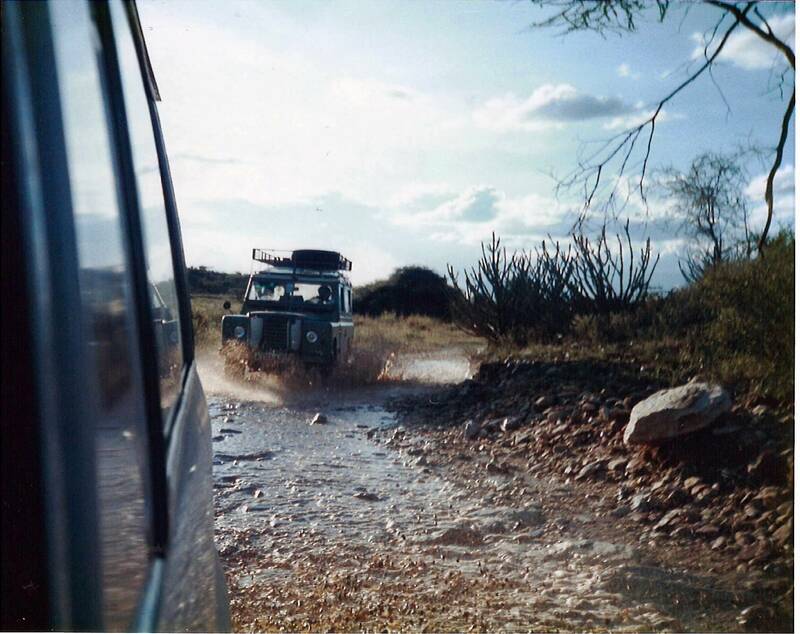 4WD told us that, at the right season, the elephants and baboons or even other animals use to come here especially to eat the fermented fruits of the palm… After what they get drunk and you have to be careful not to be on their way! Up the banks, the umbrella thorn (another acacia) and the commiphora trees, also very thorny, are predominant. The latter produces a very nice scented resin (dried sap) which is used to make local incense or myrrh. We came back to the campsite at around 11.00 AM and had a nice brunch. Then we packed up quickly (sigh) and went desperately for a swim at the neighbouring Buffalo Springs National Reserve, adjacent to Samburu’s. We found the springs crowded! A huge amount of school children were using the lovely basin where the main spring is collected and protected from the animals by a big circular stonewall. 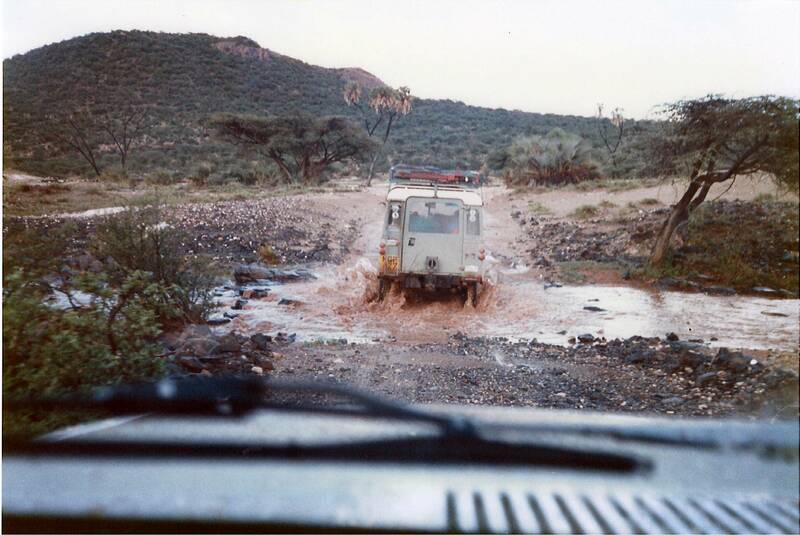 So we went for the “side-springs”, not to swim, which is not possible there, but to collect leeches instead of getting rid of our “miasmas” and accumulated safari dust. 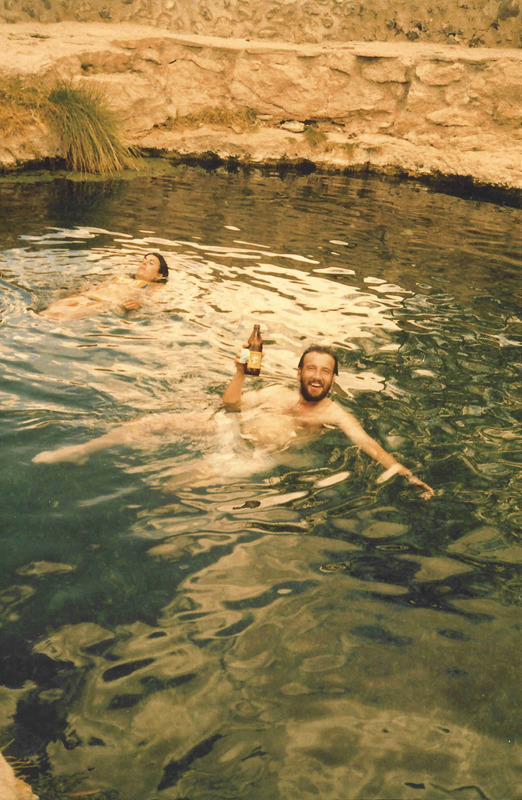 A good swim in spring water (picture taken on a previous safari): That is what we missed on that last day! We quit the spot at 2.00 PM (sigh again). Short after we passed the gate, at only 3.00 PM, the fan belt of the Land Rover jumped out! But the mechanics (4WD and ScoutSpirit), put it right in no time. It is so reassuring to have fundis around! Both cars then headed for Nanyuki and stopped for petrol there. Next stop and arrival in Nairobi was near the “Premier Club”. It was established that both teams were first “ex-aequo”. We congratulated each other heartily and admitted that our drivers were very well trained and the organisation perfect! So when do we start again? 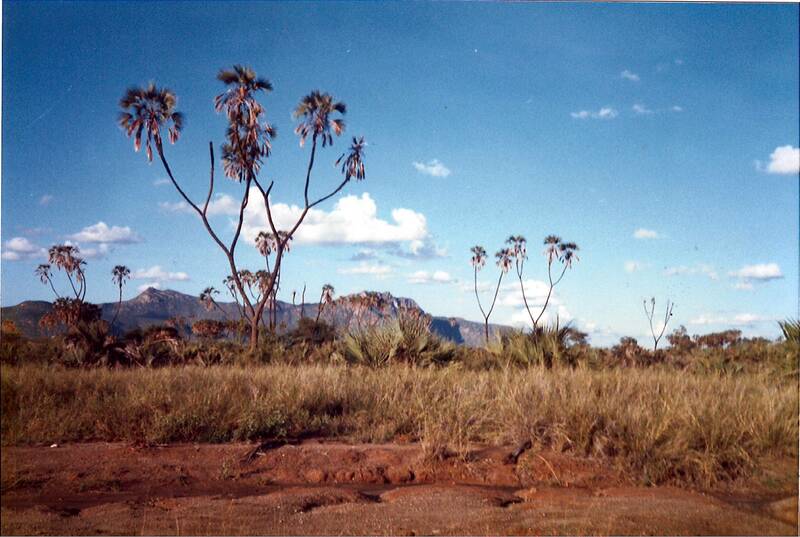 Landscape around the Ewaso Nyiro, nearby the Shaba campsite: Doum palms and red soil (laterite). X-ray: as she has a very accurate view and the ability to spot before anybody any living creature miles around you in the bush! You may have understood that they were the actual cars of the original African Safari Rally that took place at Easter in Kenya! You will see that “gorgeous”, pronounced with emphasis and a French/Spanish accent, sounded funny and it was adopted as THE word of this long week-end! Words in italics are Kiswahili terms that we adopted as we found them more expressive or poetical than ours. Staying near a river is a guarantee of good game spotting as many animals come to drink or bathe. 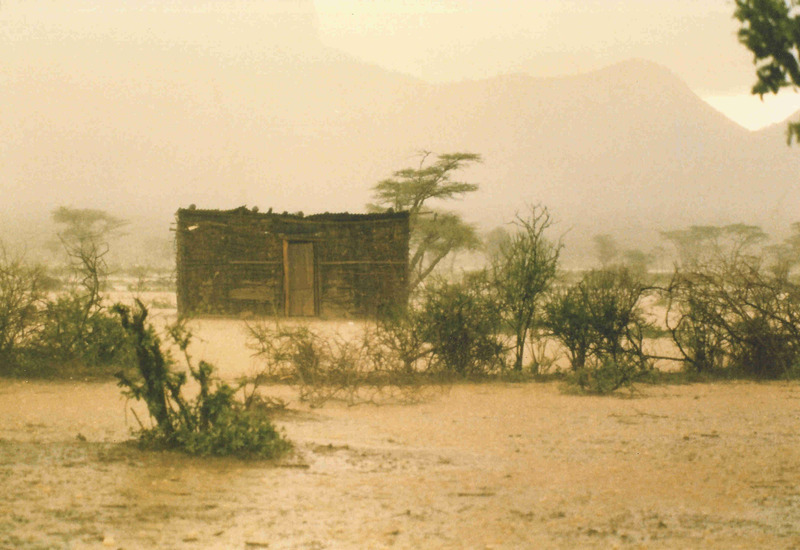 The Ewaso Nyiro (brown river) is named after its quite dark water. Although these were the best and nearly sole qualities required for a campsite in almost any national park or reserve in Kenya. Yes, I know, coming from Switzerland where camping places have hot water, showers, washing machines, tumble-dryers, dishwashers, swimming pools, ping-pong tables, cooking places and very technical barbecue devices… it is always astonishing to come to a simple spot near a river and to be told proudly “this is the campsite, Madam” as you cannot tell the difference with the rest of the whole wild area! After the Afrikaans’ name given to rocky hills appearing like islands in the plains, i. g. in the Serengeti’s savannah. They could have their own ecosystems (plants, animals and interactions amongst them). Checking on internet nowadays (September 2014), it seems that a monument has been placed since then. The shell was handed over to the Reserve’s management on exit. 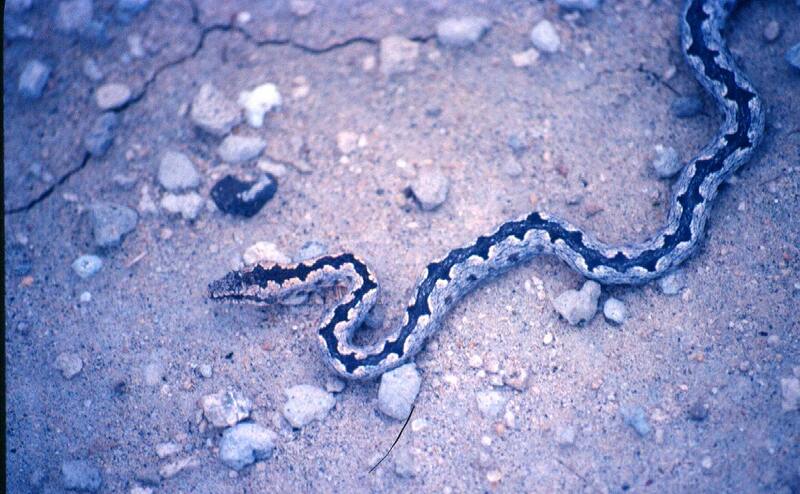 The snake was an Eastern bark snake (Hemirhagerrhis nototaenia), mildly poisonous, unlikely to be harmful to man. Yerba mate (Ilex paraguariensis) is a cousin of our European holly (Ilex aquifolium), the latter being poisonous!